6TH FLOOR GUARANTEE, FACING THE BEACH, DIRECT ACCESS TO THE MAIN BEACH FROM CABO (Medano Beach ), 5 MINUTES WALKING DISTANCE FROM CABO DOWNTOWN, NIGHT CLUBS, AND DELICIOUS RESTAURANTS. WHAT ELSE CAN YOU ASK? 2300 Sq. Ft. Spacious One Bedroom Suite Ocean Front with King Size Bed, Bathroom with Shower, Kitchen & Utensils, Dining & Living Area with Sofa Bed, TV, Telephone, Private Terrace with Jacuzzi, 2nd Bedroom 100% private with king bed and private bathroom air conditioner ocean view AC. ****Sleeps4. Maximum Capacity 6. * (see floor plan ). I don't know if you have been to Cabo before or if you are familiar with the area, this penthouse is located on the main beach, the only safe beach to swim and where the nice restaurants, bars, and all the fun stuff, also 1 block away from down town. 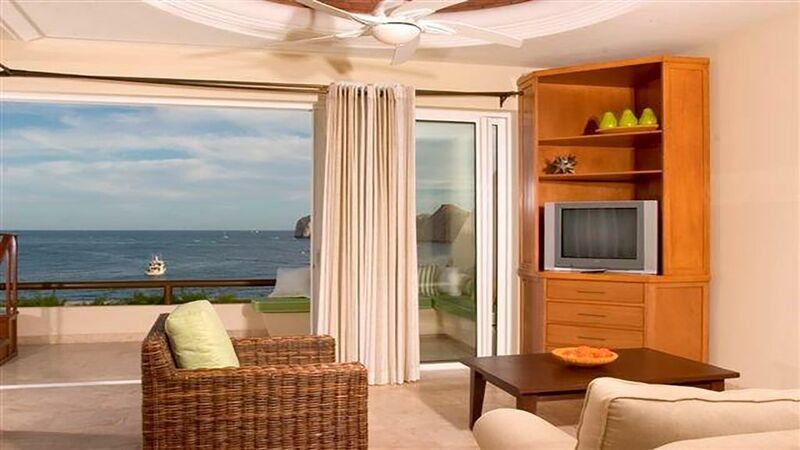 This penthouse studio is the best location of Cabo AND the resort.we are in the only building in the resort that is beach front and yes, you get DAILY MAID SERVICE and ALL the usual services that come with the resort like towels and use of all the areas; gym, spa, beach club, restaurants, room service, etc.... Awesome location. Keywords: 1 bedroom penthouse. Beachfront, penthouse, oceanfront, waterfront, beach, pool, safe, fun, family, walking distance, fishing, singles, romantic, swim beach,bars,close to town,. We are originally from Cabo and grew up on this bay, we all learned how to swim here, so we understand how nice it is to stay in this awesome location. We still live here and have a house on the beach on the corridor but we keep this condo to relax and hang out on the beach so we can have a few drinks and not have to drive anywhere!! We hope you enjoy our magical place on the bayy and have you come back year after year. Location location location!!!! This place has it all. It has beautiful beach and awesome restaurants and bars and it’s located right in the heart of the action when you want to walk around. There’s also live music at the brewery on the top floor and it was awesome! The only Goofy thing was the woman who pretended she was going to check us into the hotel was actually trying to sell us timeshares. The room itself was beautiful and clean! The location was great too! My only set back was that it was not too quite. Music is pretty much always playing and you can kind of hear it from inside the room. But if music is not a big deal to you, then it is 100% a perfect place. Great location if you want to be near great restaurants and right on the swimming beach. You can walk everywhere. The room is just a bedroom off the penthouse but has a very nice bathroom. It has a balcony but right now there is construction going on near by. We rented the penthouse for one night and it was beautiful. Thank you for sharing your experiance to new travalers . I am glad that you love our Luxury studio ocean view and also the One bedroom Executived ocean front for 1 night. In fact Cabo Villas Beach Resort is performing construction on the opposite side from our condonminium which mean its DOES NOT afect any of the amenities that we offer such as POOL , Jacuzzi and Restaurants , hallways and recreation areas are 100% clear of construction . Hope you come back soon and enjoy the new pool that we will have soon . We couldn’t get hot water to shower, which was a bummer. But the room was nice. Missing a couple of basics - small table on the deck, tissues, wash cloths. Not a big deal. Overall very nice. Would stay here again and work out the hot water thing. Lively location, walk to great restaurants and the beach/view are 2nd to none. Baja Brewery on top floor has the best view in the city! Things we enjoyed: Excellent resort location in the heart of Medano beach (really perfect), friendly staff with no hassle at check-in, lovely pools, and good restaurants. This hotel is as close as you can get to The Office, Mango Deck, and Baja Brewing (when you need a break from the Coronas and Modelos). We had a great time on the beach, and the bed was a very comfy place to crash after we wore ourselves out. The room is also very well insulated, and there's very little noise from the pool or beach parties. Problems: We feel misled about the exact location of this suite, and that is the reason we are giving it three stars. One of the photos shows a red photoshopped rectangle around (presumably) this property location, the left hand half of which is clearly ocean facing. Be aware that the suite listed in Property ID 324501 occupies *ONLY THE RIGHT HAND THIRD* of that red rectangle. It is NOT a direct ocean front room as might be reasonably inferred from that photo. In fact, the rooms farther from the beach probably have less obstructed views. We hope this is an oversight on the part of the owner, and not an intentional deception. Overall we enjoyed our stay, but we likely would not have paid what we felt was an ocean front premium had we better understood the room layout. We found all other room photos on the profile to be accurate. The view is absolutely amazing! It was a pleasure dealing with Valerie and would do it again. Her suite is the best in the entire hotel and within walking distance from anything you need. Set up on the main beach in Cabo, On the top floor of the beachfront building, just go downstairs and catch a 3 minute taxi boat ride to the arch and enjoy the only safe swimming beach in los Cabos.